Schlock-Wire: Scream Factory Unleashes A Double-Feature Blu-Ray Of THE DUNGEONMASTER And ELIMINATORS – Schlockmania! 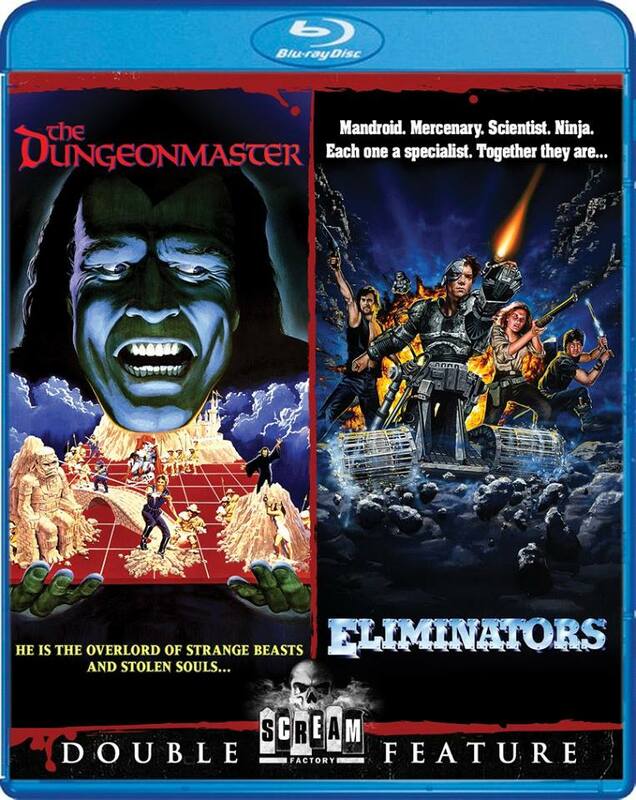 Scream Factory presents a double dose of science-fiction fun with The Dungeonmaster & Eliminators in their Blu-ray debuts on December 15, 2015. This release comes complete with a new interview with director Peter Manoogian. Paul, a young computer ace, is forced to pit his physical and mental skills against unimaginable odds when a hulking wizard looking for formidable opponents picks Paul as his next challenger. Paul faces a series of seven spectacular and death-defying challenges and must survive not only to save his life but that of his girlfriend’s too! Jeffrey Byron (Metalstorm: The Destruction of Jared-Syn) and Richard Moll (Night Court) star in this eye-popping thriller featuring an appearance by W.A.S.P.! A mandroid – part man and part machine – seeks revenge on the evil scientist who created him. Enlisting the help of a beautiful woman and a mysterious ninja, he pursues the scientist in hopes of stopping him before he can be further harm to humanity. Andrew Prine (The Town That Dreaded Sundown) and Denise Crosby (Star Trek: The Next Generation) star. Andrew PrineBlu-RayCharles BandConan LeeDenise CrosbyEliminatorsEmpire FilmsJeffrey ByronPeter ManoogianRichard MollScream FactoryThe DungeonmasterW.A.S.P.